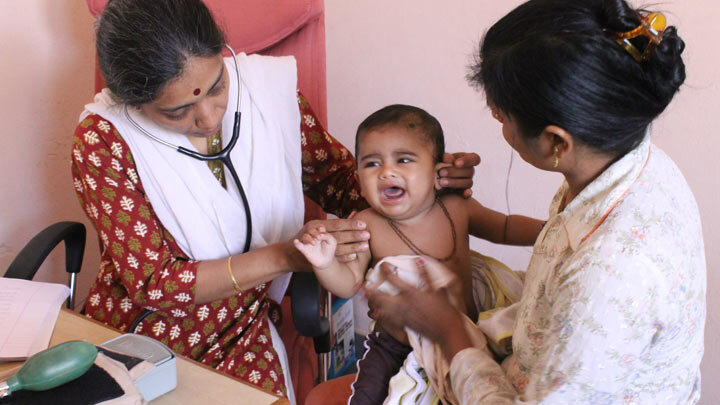 Shanti Arogya Mandir, the mobile health clinic, commenced operating in 2003, with the aim of providing primary health care and creating health awareness in the rural population of the villages surrounding the ashram at Magod in the Valsad district of Gujarat. This endeavor is led by Dr. Rakhee Thakar (M.D. Pediatrics). After a medical degree with distinction and medical experience as Pediatrician in leading hospitals of Delhi, she now runs the free mobile dispensary and clinic at Shanti Arogya Mandir that serves the rural population in Valsad. The mobile clinic travels daily to local villages and a neighboring Old Age home, offering free on-site medical advice and medication. It also offers afternoon consultations on the ashram premises. More than 100,000 patients have received free medical aid from the mobile van, and over 30,000 have attended the ashram clinic. The mobile dispensary also plays a role in educating people about health and nutrition, hygiene, waste disposal and compost, potable water, and the prevention of environmental pollution.